You might want to avoid Holmes Lake, the neighboring dog run, and nearby portions of Antelope Creek. It seems you might run into the meatloaf your neighbor ate earlier this week after wastewater backed up into Antelope Creek. Eww. Here’s hoping for a good rain to flush (ha!) things out. OK, folks, what are the best Halloween activities going on today and tonight? The Wilsons are headed back to Gateway for some safe and relatively bland indoor trick-or-treating. Robbie will no doubt think it’s the coolest night ever. Unfortunately, it means the poor neighborhood kids won’t be getting any candy from our house. Sorry kids. It sounds like the weather is going to be pretty darn nice tonight. Couple that with the day of the week, and I suspect you’d best hide your jack-o-lanterns if you want them to see All Saints Day. I’m not saying I ever engaged in any delinquent shenanigans when I was a teenager, but if I were a teenager and I were in the mood to engage in a little petty destruction, tonight would seem a pretty darn nice night to do it. I realized just now that I have given exactly zero thought to what I will wear tonight. Maybe I could whip up a “Palin vs. Clinton 2012” t-shirt. That’d pretty much terrify everyone. The Missus knows I love the humor behind politics, so for my birthday she got me tickets to see The Capitol Steps tonight at the Lied Center. Are any of you going to the show tonight? 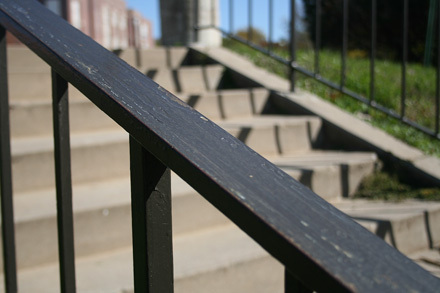 State Senators will return to Lincoln on November 14 for a special session to amend the law. Now that state law requires communities to fluoridate their water, it’s interesting to see the fluoride debate heat up across the state. I’ve never had a problem with fluoride. I see fluoridated water as being very similar to iodized salt. Yet obviously some people get pretty excited by the notion that the government is pumping “medicine” into the water supply. I figure heck, they may be brainwashing me but at least I’ll have good teeth. If fluoridation were brought to a vote in Lincoln, would we keep it? Start your engines, Segway owners! Assuming Mayor Beutler doesn’t have a fear of gyroscopes, Segways will soon be street legal in Lincoln much like bicycles. And there was much rejoicing among approximately 0.0012% of Lincoln’s population. Teasing about the small target audience of this ordinance aside, it seems that communities are going to be faced with more and more questions of “Is this vehicle legal?” in the coming years. Rather than having to go through the City Council and Mayor every time, can we find a simpler way to evaluate the acceptability of new and unique modes of transportation? I haven’t thought much about the details, but perhaps it would be nice if there were national standards for some sort of urban testing courses for new vehicles. Vehicles that could meet different criteria could then be treated like pedestrians, bicycles, light vehicles, automobiles, or trucks, as appropriate under local law. Was state fair always in Antelope Valley’s sights? I’m still trying to process it all, so my reactions at this point aren’t very organized. I do have a couple thoughts at this point. First, of the six stories I felt like today’s two articles (the last two listed above) are the least worthy of concern. The gist is that Lincoln paid “well” to purchase many of the properties in the path of the project. So long as there isn’t any apparent corruption—i.e. the City paid more to politically connected property owners than to unconnected owners—I applaud the owners for getting a “fair” payment. I put “fair” in quotation marks because it’s hard to establish what’s truly fair with the government staring you in the face. But overall, I haven’t heard many complaints from property owners. As for Michael Morosin, well, there will always be a couple people like Mr. Morosin walking the line between causing trouble and standing up for his rights. Then there’s Kent Seacrest. I had no idea how much he was being paid for his work. Two million bucks since 1995? Yowzers. Did you realize he was raking in $280 per hour to give those tours? Just think what the City could do with $280 per hour. Folks worried about the costs associated with the proposed Haymarket arena should pay particular attention to the budget numbers. The Journal Star predicts the AVP will cost at least $34 million than originally planned, after adjustments for inflation. That the project cost more than estimated shouldn’t come as a surprise. That the overrun isn’t even higher might be a bit of a surprise. After reading the series, very little of the information caught me off guard. As it currently stands, it seems apparent that we could have done the project more cheaply, and Lincolnites probably would have been happy with a far more modest version of the project. The Antelope Valley Project has taken a tremendous amount of resources away from other areas of Lincoln, and it will continue to do so. It’s far too early to say if it is all worth it. What good is it, for example, if Antelope Valley is a jewel while the rest of Lincoln’s transportation infrastructure crumbles? But it’s just as far to ask what damage would be wrought by a massive flood, or by missing the opportunity to build an innovation corridor. Fire away with your praises, rants, and questions. 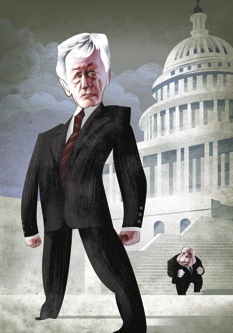 Next week’s issue of The New Yorker profiles our own Chuck Hagel. The online version of the story is available now. I know I said that The Missus and I were thinking about eating in Omaha on Saturday night. I goofed. Eating dinner in the Big O would have required me to drive up there twice in one day, and I just wasn’t in the mood for that. Instead, The Missus and I stayed in Lincoln and decided to give Magnolia a try. We have talked about it since it opened, and we have heard a lot of good buzz. I didn’t go into the meal with an “I’m going to review this place” mindset, so think of what follows as a mishmash of shallow reactions, not something I’ve put a lot of thought into. My focus on Saturday was on my dining companion, not the restaurant. I liked the atmosphere at Magnolia. It’s cozy, and it’s right at home in the Haymarket. The double doors at the entryway do a good job of keeping cold air out of the smallish restaurant. A trio of musicians played in the back. The music was a little loud despite it feeling like the musicians were trying to hold back, but the live tunes were welcome nevertheless. The TVs over the bar showing Wheel of Fortune felt out of place. Much of the seating up front, where we sat, is very cozy. As in, obese people better watch out. I ordered the shrimp and scallops panang. It included three scallops and five shrimp served over asparagus and accompanied by baby reds. It was preceded by a tasty bowl of ham and bean soup. The Missus went with the chicken cordon bleu. Both meals were delicious, if not in a knock-your-socks-off kind of way. The real story of the night was the service. On a standard grading scale, the restaurant’s service gets a D at best. Our server was confused about the special—we never did find out if the special was duck or chicken, though we’re pretty sure it was some sort of bird—and neither our server nor the one at the table next to us was familiar enough with the menu to know which items came with sides. Both of the tables next to us received their salads and meals at the same time. And so on. The mistakes and miscues were very unlike what I would expect from a restaurant of Magnolia’s caliber. How many of you have been to Magnolia? Did we just catch them on an off night, or are service problems a regular occurrence? Crescent Moon Coffee is in the Haymarket at 816 P Street. Edit: I’ve been told this edition of Where in Lincoln is waaaayyyy too hard. Well, this is the color version of the photo. Perhaps this will help some of you all. Edit: Despite some valiant attempts and close guesses, no one was able to identify where in Lincoln this picture was taken. Drat, this is a week I wish I had cable. Comedy Central’s The Daily Show was in town recently to film a segment that will air this week. The segment will cover the study performed by a couple UNL Political Science professors (and others) that was in the news last month. If you hear the date / time that the show will air, let us know! The Lincoln Airport is in the news a couple times this morning. First, the airport lost $3.15 million this year. That’s a $600,000 “improvement” over last year. The big news appears to be that the airport’s industrial park is doing quite well. In other news, the Airport Authority voted to spend about $90k to build an addition to the south end of the terminal so that security screening is out of view. It seems like a couple thousand dollars worth of cubicle walls might have done the trick just as well. Supposedly the airport “has gotten complaints” about the current security setup. I’m not sure what the problem is, but I’ll bet it has something to do with people not wanting their underwear on display. Fair enough. But personally, I like having the security personnel in full view. It keeps them honest, and it helps ensure that baggage is properly handled for at least a small portion of its journey. Well, that may be correct, but what does that have to do with Boo at the Zoo? What strikes me about his opinion, and indeed this entire debacle, is how so many people have entirely missed the point that the Zoo has no obligation to draw the line between church and state. The Zoo is not a government department. The Zoo has no obligation to allow religious speech on its property anymore than you or I do, or that DaVinci’s does, or that the gas station down the street does. In short, the establishment clause is NOT the issue here (If there is a first amendment issue here, I would argue that it is the doctrine of being free of forced speech, and not the establishment clause). Clearly, there are those in this community who view (and want to view) this entire story through “culture war” lenses. Its an understatement to say that “political discourse” in this day and age doesn’t have its share of hyperbole. Fine. But I do hope that, in the future, discourse can at least revolve around reality. I can’t believe I have heard exactly zero buzz about Billy Brown’s (Downtown in the former Great Wraps space on O Street), save for Jeff Korbelik’s review. There was a little excitement about the possibility of a 9 South Chargrill-style restaurant long before it opened, and then ... nothing. Have any of you been there? I love 9 South, so I definitely want to give Billy Brown’s a try. The building that formerly housed P.O. Pears now sports a big 9 Red (or is it Red 9?) mural on the side. Buffmeat gave Southwest Pit BBQ a try. I think that’s the first I had heard about the new restaurant in the high-turnover location on Sun Valley Boulevard. I stopped at Lina’s late last night on the way home from a pair of cold and wet soccer matches. Maybe I was just in the right mood, but my pollo asado burrito was awesome. The Missus and I may go to Omaha on Saturday night for supper. We have very little experience eating in Omaha. Where should we go?